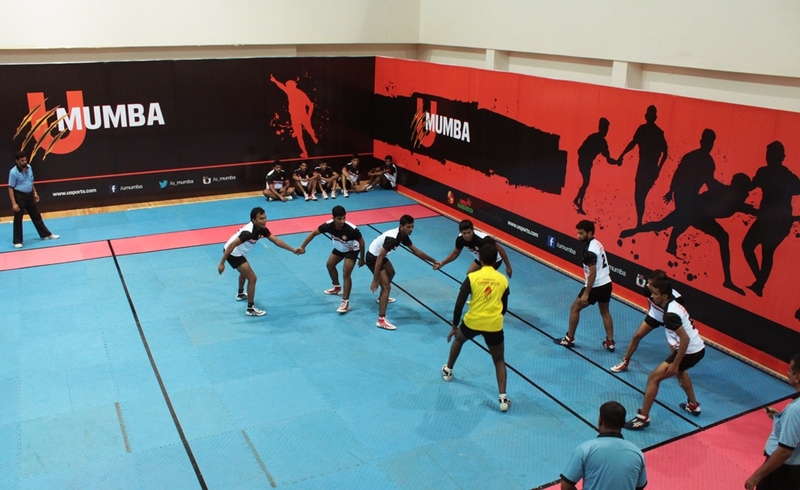 Mumbai: Unilazer Sports, the sports arm of Unilazer Ventures and the owner of the Mumbai Franchise -“U Mumba”, which will be a part of the upcoming Pro Kabaddi League, showcased its efforts to unearth local talent on Friday with its ambitious “U Mumba Future Stars” programme with the second round of Knock-Out tournaments featuring players from North Mumbai. Conducted in three phases, the Knock-out tournaments will feature the top 24 clubs from South Mumbai, North Mumbai and Thane district. Each region will witness 8 teams, representing respective clubs who would compete in Knock-Out challenge against opponents from the same region. Through rigorous tournaments, the four players from each of the three regions will form the “U Mumba Future Stars” team. Today, the teams representing Om Creations Club and Arunoday Krida Mandal kicked off the North Mumbai tournaments amidst cheers and excitement at the Dharavi Sports Complex, Mumbai. Each team from the top 8 clubs put up a tough fight as they battled to qualify for the finals. The tournament also witnessed the presence of Ms. Snehal Salunke, International Kabaddi Champion and Asian Games 2012, Gold Medalist who greeted and exchanged pleasantries with the players as the Chief Guest for the evening. Arunoday Krida Mandal, Ghatkopar, was the first to set the match rolling as they competed with players from Om Creations, Khar, through an exciting match which lasted for approximately 45 minutes. Om Creations eventually lost out to the powerful raiding technique demonstrated by player Haridas Bhayde and the team’s raiders failed to counter-attack Amar Nivate in defense. Also advancing to the semi-finals were Parle Sports Club, Siddhi Krida Mandal and Om Sai Krida Mandal. Parle Sports Club defeated Swastik Krida Mandal 44-25 before Siddhi Krida Mandal staged a late fight-back to overcome the challenge of G.S.P.M., Ghatkopar, 23-17. The match between Siddhi Krida Mandal and GSPM turned out to be a contest of attrition as the lead kept changing hands through out the encounter before Raju Lohar and Rajesh Bendur showed all-round skills to take their team to victory. The Chief Guest, Sneha Salunkhe was extremely impressed with the arrangements and facilities created for the tournament and also emphasized on the fact that such efforts were critical in promoting Kabaddi as a sport in the country. Arunoday Krida Mandal bt Om Creation 46-24; Parle Sports Club bt Swastik Krida Mandal 44-25; Siddhi Krida Mandal bt GSPM 23-17; Om Sai Krida Mandal bt Shivsena Krida Mandal 19-18. Founded by Ronnie Screwvala, Unilazer Sports, a division of Unilazer Ventures Private Limited operates with a focus to be part of best preparing the present and planning for the future of Sport in India. Unilazer Sports aims to transform the way we live, persevere, learn, compete, enthrall, inspire and entertain ourselves. With “U” as the umbrella brand for Unilazer Sports’ franchisee, it’s as much Unilazer as its U and youth. U Mumba, the Kabaddi franchise for Pro Kabaddi, is derived from Mumba, the mother island that gave birth to a mega city that is today Mumbai. Pro Kabaddi is an eight-city league to be held between July 26th to August 31st 2014. The league will be carried live on prime time TV by Star Sports. This unique effort has the formal backing by the International Kabaddi Federation (IKF), the Asian Kabaddi Federation (AKF) & the Amateur Kabaddi Federation of India (AKFI), who will be closely associated with the organization and delivery of this event.